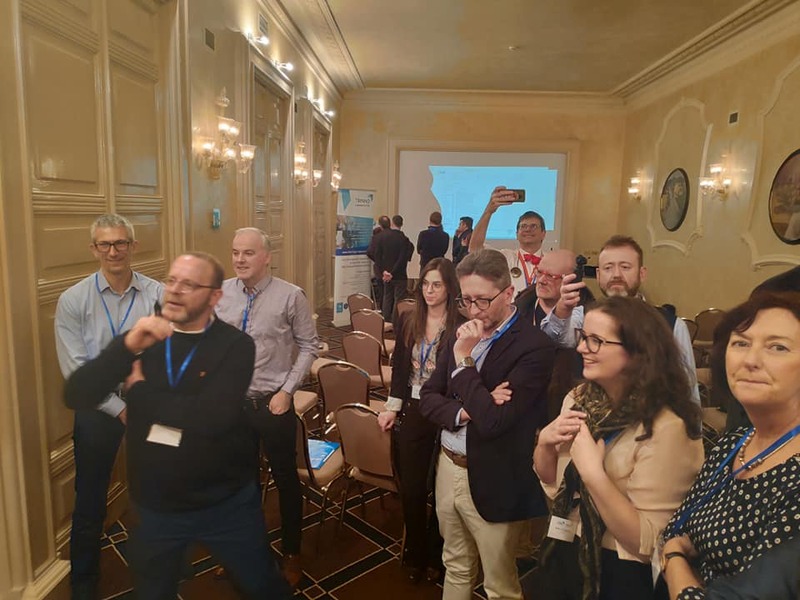 The TRINNO Projects’ (Business ecosystem for TRadition and INNOvation) partners including the NWRA, Wetbic, Leitrim County Council and Roscommon County Council gathered for an Interregional Workshop Learning Event in Florence, Italy. Hosting partner and Lead Partner of TRINNNO project Arezzo Innovazione organised the open conference on Industrial Modernisation and Interregional Cooperation. The conference was organized together with NMP-REG project (Interreg Europe Programme). This conference gave the opportunity for an open discussion on how I4.0 is being applied across Europe and how various European and regional actors are dealing with the opportunities and challenges that it brings. Representatives of academia, experts, enterprises, general public and representatives of different Interreg Eurrope’s projects gathered to address how various European and regional actors are dealing with the opportunities and challenges that I4.0 brings. As Marc Pattinson, the Policy Learning Platform’s expert on Research and innovation mentioned, sharing methodological tools, thematic-based cooperation, developing financial instruments and promoting business and SME engagement are all opportunities of industrial modernization and partnership that I4.0 brings. For a regional perspective Albino Caporale, Director of Tuscany region spoke about the possibility to use these projects to share experience about the methodology to make efficient the technology transfer. Joining the Interregional Workshop via conference video was also Nikos Pantalos – senior expert of the Directorate-General for Internal Market, Industry, Entrepreneurship and SMEs. He addressed the importance of interregional cooperation for research and innovation and emphasized that Industrial Modernization also highlights cooperation and joint working with Interreg Europe’s and Horizon 2020 projects. TRINNO and NMP-REG projects, are reaching the end of 3 years of intense interregional cooperation in two different thematic areas. First deals with digital innovation in traditional sectors and second with technology transfer in the field of nanotechnologies and new materials. Two different themes but connected by the fil rouge of I4.0 in manufacturing. But to show even brother input of Interreg Europe’s projects, two other Interreg Europe projects participated at the conference (INNOPROVEMENT and STEPHANIE). Both are playing a strongly active role on the theme of I4.0. Peter Keller, representative of Hungarian Ministry of Finance – partner of INNOPROVEMENT project emphasized that implementation of Interreg Europe’s project shows that good practices, SME service catalogues and SME surveys crucially shape RDI calls. The afternoon session took place simultaneously, holding two in-depth workshops on traditional manufacturing and advanced materials. TRINNO consortium went in-depth into the theme of opportunities and risks of Industrial Modernisation for Traditional Manufacturing SMEs. With this necessary measures of public policy were addressed. On the second day, dedicated to Interregional Learning Event, TRINNO partners shared with each other the Action Plans and the activities to be carried out by the end of Phase 1. This included an overview of the results of the Mid-Term Review and launching of Phase 2. The success of many projects comes from learning and sharing experiences. These can be staff exchanges, interregional exchanges of knowledge, experiences and inputs, Study Visits, GP presentations etc. What is evenly important is that these projects and these tools provide policy improvements that address today’s challenges and opportunities. And the same goes with I4.0. It is undeniable that I4.0 is taking off across Europe, it concerns automation and data exchange in manufacturing technologies, making everything around manufacturing processes digitally connected. I4.0 is influencing SME competitiveness; some would even claim that it is dangerous risk for traditional sector. But with the right approach, provided knowledge, structural support and customized policies from local, national and EU authorities I4.0 can bring variety of opportunities. Industrial modernisation processes need to be guided by policies and strategies implemented by policy makers, in this way it is likely to avoid that opportunities linked to the I4.0 could become risks.